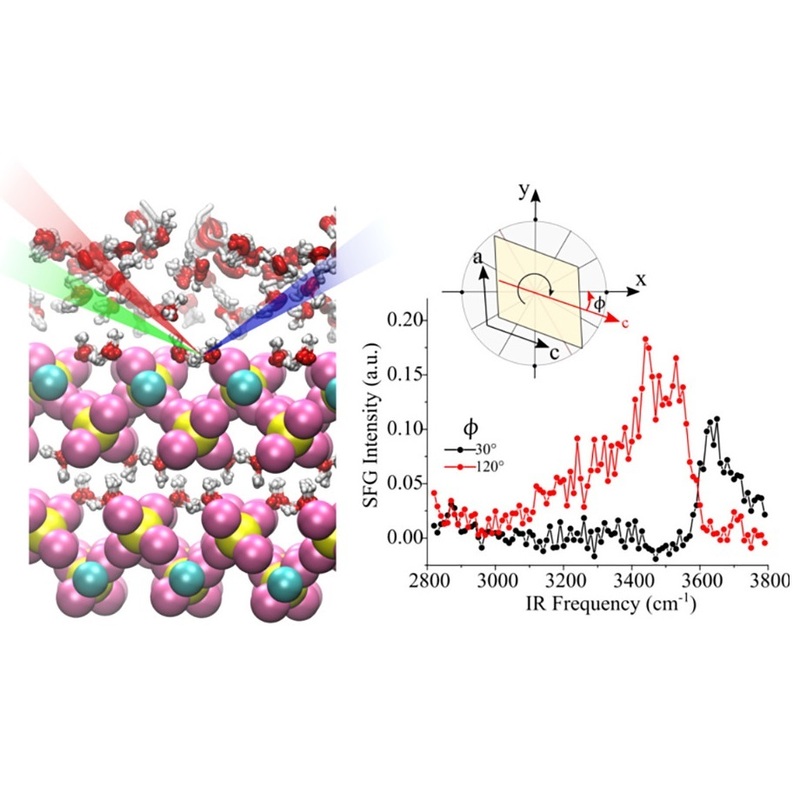 Interaction of water with the gypsum (010) surface: structure and dynamics from nonlinear vibrational spectroscopy and Ab initio molecular dynamics. SANTOS, Jaciara C. C.; NEGREIROS, Fabio R.; PEDROZA, Luana S.; DALPIAN, Gustavo M.; MIRANDA, Paulo Barbeitas. Abstract: Water-mineral interfaces are important for several environmental, industrial, biological, and geological processes. Gypsum, CaSO4·2H2O, is a widespread mineral of high technological, medical, and environmental relevance, but little is known about its surface structure and its interaction with water. A molecular-level understanding of gypsum/water interface is given here by a combined experimental/theoretical study. We investigate the structure and dynamics of water adsorbed from vapor on the gypsum (010) single-crystal surface at room temperature, combining sum-frequency generation (SFG) vibrational spectroscopy experiments and ab initio molecular dynamics (AIMD) simulations. The SFG spectra of gypsum at low relative humidity (RH) show an anisotropic arrangement of structural water molecules and the presence of dangling OH groups. The AIMD simulations allow a detailed assignment of the SFG spectra and show that the cleaved (010) surface rearranges to have only 25% of the OH groups pointing away from the surface. At higher RHs, the first adsorbed water layer binds to these OH groups and forms an anisotropic arrangement, but with the amount of free OH groups significantly suppressed and without any significant diffusion. Upon adsorption of a second water layer, although the topmost layer of molecules is more disordered and dynamic than the previous one, its structure is still influenced by the gypsum surface underneath because it has a much reduced amount of free OH groups with respect to the free surface of water, and a slower surface diffusion with respect to bulk water. The theoretical results corroborate the experimental ones and provide an accurate atomic characterization of the surface structure.